According to the Roman legend, in one of the seven hills surrounding Rome, the Sabines erected an altar in honor of the god Quirino. The hill, from that day on, was known as the Quirinal Hill. The “Palazzo del Quirinale“, not so far from the Hotel, has hosted the Royal Family until the day when the monarchy was abolished and it became the home of the President of the Republic. Probably one of the best location for Rome, the Hotel Quirinale is close to the Metro, Train and Bus Termini and also within walking distance of most of the main attractions in Rome. Lauren and Sean, a nice and sunny Irish couple from Dublin, after the wedding ceremony at San Silvestro in Capite have the Aperitivo in the Hotel courtyard. Lauren is a freelance journalist and broadcaster. She writes about music and the arts for The Irish Times, including a weekly Music News column in The Ticket. She also contributes to The Sunday Times and various online publications, and regularly features on RTÉ Radio 1’s Arena arts show, where she discusses and reviews albums and films. As you can imagine it’s a great pleasure to play for someone very experienced in music, actually, it is both a privilege and a great responsibility!!!! The entrance music for bride & groom is ‘The Power of Love’ by Huey Lewis & the News and for the party they choose a mix of modern indie/rock/pop stuff and songs from the 1960s, 1970s disco and some Irish and Italian songs. 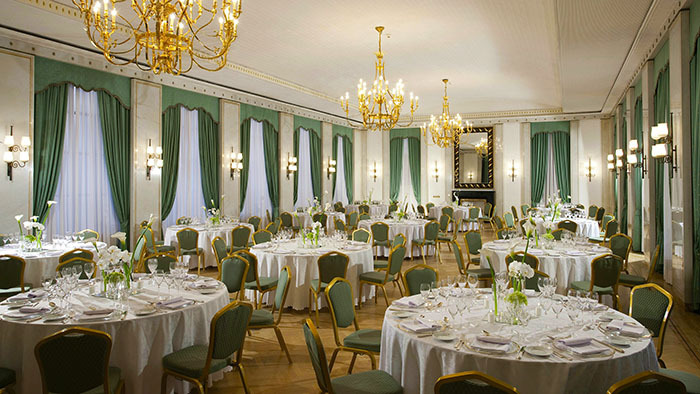 The dinner and after dinner party take place in the Verdi Room, Guty & Simone provides background music during dinner and live + dj set during the after dinner wedding party.